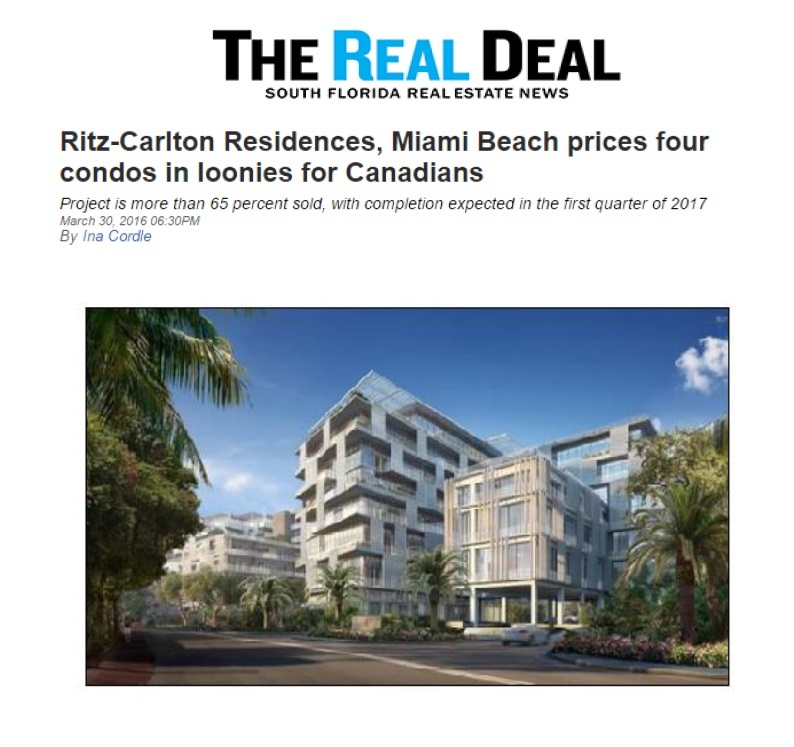 Here’s a loonie idea: The Ritz-Carlton Residences, Miami Beach is pricing four condos in Canadian — rather than U.S. — dollars for one night, hoping to lure buyers with a 23 percent discount. Ophir Sternberg, founding partner and CEO of developer Lionheart Capital, told the The Real Deal that he is hosting a party Wednesday night at the Ritz-Carlton Toronto to sell the units. Sternberg is in Toronto for TRD‘s first U.S. Real Estate Showcase & Forum. The two- and three-bedroom condos are normally priced from $2 million to $3 million or $900 to $1,200 per square foot, he said. Launched in 2014, the Ritz-Carlton Residences, Miami Beach, is currently more than 65 percent sold, Sternberg said. The project has already attracted several Canadian buyers, but it has become harder for them to buy as their currency has weakened, he said. The currency is currently trading at 77 cents to the U.S. dollar. So Sternberg figured he’d offer the four units for one night only in Canadian dollars and create a buzz. Shortly before the event, Sternberg said he had already received 300 RSVPs and had to switch to a larger venue to accommodate the crowd. Some prospective buyers had already asked him how many units they can buy, he said. “We hope it will bring a lot more buyers,” Sternberg told TRD. He expects to leave Canada with some signed letters of intent, and then meet with the prospective buyers in Miami Beach, where they can tour the development’s sales gallery at 4701 North Meridian Avenue. The Ritz-Carlton Residences, Miami Beach, on seven acres on Surprise Lake, on the site of the former Miami Heart Institute, was designed by Italian architect Piero Lissoni. When completed, the luxury development will have 111 residences and 15 stand-alone villas, priced from $2 million to $40 million. The project is currently under construction, with completion expected in the first quarter of 2017.